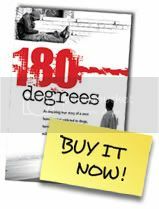 My name is Robert, and I'm the author of 180 Degrees. I will occasionally be sending out insights about my book, and some of my experiences that have been shaped by the occurrences in my book. This book is the story of my life, which honestly, makes it a little uncomfortable to promote enthusiastically. I don't want to be vein, nor do I wish to come off self indulgent. This is actually the reason I did not write this book for a number of years. It took a lot of encouraging from some close friends to help me feel secure in sharing my story. With that being said, I want to say, "Thank You" to Robert Hickey, who over lunch one day told me, "You owe it to people. You owe it to the world to put your story out on paper. Because you never know when your story is going to touch someone's life, and save their life." I remember this conversation so vividly because it was at that moment that I realized writing this book was not about me, but my opportunity to be of service to people. It has been emotionally moving hearing and seeing the number of lives, and the variety of circumstances of those lives, that have received inspiration from my book. Even people who don't come from a history of abuse or addiction have found inspiration my story. I also want to thank Chad who e-mailed me his story and said, "My parents mailed me your book while I was in prison. I read your book over and over and it not only helped me to get sober, but when I got out of prison, it empowered me to be the man I am today. I've started my own business, a gym in Palm Springs. I realize that through the severe hardships I endured, I can help other people through theirs. I will never be able to measure the number of people affected, or the number of lives saved by my story, but by the number of responses I've received, it has already touched thousands. With that as my momentum, and my passion to help everyone I can, I am driven to share this story to as many people as possible, and I hope you are too. Over the years, friends, family, and acquaintances alike have encouraged me to inspire others by sharing the story of my life. I am honoring their support with this book and hoping that it will reach those who need to hear its message the most. No matter how far down the drug or alcohol rat hole you have gone, there is hope and a way out and to find success in all areas of your life spiritually, physically, emotionally, mentally, and financially. I lived this story, and I am revealing the ugly truth of my own addiction and the story of my recovery to encourage anyone in the terrible grip of addiction to seek help. I hope my story will also inspire those already in recovery to continue their journey. The title, 180 Degrees, describes my path to recovery. I turned my life around 180 degrees. I went from being a daily-using drug addict and occasional “big shot” dealer to, eventually, a homeless addict living on the streets. Today I am a completely sober, self-reliant, self-employed husband, father, and self-made millionaire. I was able to miraculously transform my life before I turned thirty. I escaped the nightmare and created a life beyond my wildest dreams. It wasn’t easy, but I am, however, living proof that it can be done. Since drug and alcohol addiction breed tragedy, I am certain there are others whose stories are much worse than mine. I also firmly believe that this message of change and possibility applies to everyone experiencing the nightmare of addiction. After years of studying my mentors, I have adopted many of their methods for self-transformation and created some of my own. In this book, I strive to communicate what they have taught me and what I have learned through my own experience. I hope this will help you achieve your own metamorphosis. Part I of this book is the story of my miserable life as a daily drug user. In Part II, I share my story of getting sober and present the lessons I have learned from my own life experience and the lessons I learned from others. Getting sober was the first step I took toward achieving all of my dreams and goals. Anyone currently abusing alcohol and/or drugs has limited chances for success in life. An active addict may acquire some wealth or earn limited achievements but, most likely, will not find a life of peace. Drug and alcohol abuse strips the addict of that opportunity. Once I achieved sobriety, I was able to create the life I’d always wanted. Today, I have a calm and healthy life filled with love, security, friends, health, fun, peace, and, yes, wealth! I want the same for you, and it is all possible! A wonderful life is out there waiting for you! It is not easy, but it is much easier than the alternative. Working hard to better my life is so much easier than working hard to overcome the problems I created for myself while active in my addiction. I used to live with so much shame and guilt about the actions I’d taken and the loved ones I’d hurt. Living in sobriety is far more rewarding and pleasurable than chasing a drug-induced high. Chasing that high led me down some pitiful paths, and at the end of those paths, I was barely recognizable, but I came back from that life and so can you. Anyone can create the life they desire! I hope that this book inspires you to go after your dreams and make them happen. Mentors: Mike Ferry, Anthony Robbins, Dr. Wayne Dyer, The Dalai Lama, Neale Donald Walsch, Brian Tracy, Stephen Covey, Eckhart Tolle, Robert Kiyosaki, Richard Carlson, Napoleon Hill, Norman Vincent Peale, Deepak Chopra, Martin Schwartz, Dr. Phil McGraw, Rhonda Byrne, Lama Surya Das, Marianne Williamson and Og Mandino for helping me become the man I am today. I also want to thank my friends and family for their support in the writing of this book: my wife, Halle and my son, Skyler, Dieter T., Ginger Coffey, Debra Erdman, Al, Anita, Robert H. and especially Lisa Grantham for the work she did with the first rewrite. Each did their own special part to make this book possible.